A multi-course dinner served with wine, beer, and kombucha! This is not a cooking class. We're partnering with friends to bring some new stories to our classroom! One of our culinary instructors, Dario Barbone, is the culinary director of MUTEK.SF, a US iteration of the ground-breaking music, arts, and technology festival taking place May 2-5, 2019. This year's edition of the festival features Chef Anthony Myint as the culinary ambassador. The James Beard-nominated restaurateur and famed chef of Mission Chinese, The Perennial, and Commonwealth is also the mastermind behind ZeroFoodprint, an initiative helping bring environmentally conscious practices to the table. 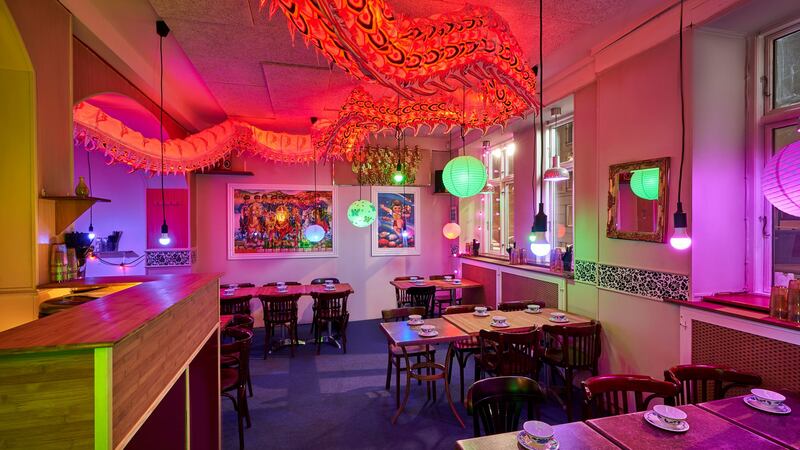 The menu from Anthony Myint blends all his culinary endeavors, including the recently opened Mission Chinese Vesterbro in Copenhagen. He’ll be on hand to illustrate the ZeroFoodprint mission and show us how we can all contribute by making conscious choices about the way we cook and eat. *If you have any allergies, please email us at info@18reasons.org. We'll do our best to accommodate requests when given with advance notice. We are also excited to be working in collaboration with Imperfect Produce. 20 billion pounds of produce are unharvested or unsold each year because they do not meet the arbitrary cosmetic standards of grocery stores. Imperfect Produce sources this ugly and surplus produce directly from farms and have recovered 40 million pounds of produce since launching in 2015. Additional donations have been graciously provided by Domaine Anderson, Calicraft, GT Kombucha, and Vichy Catalan. About the Chef: Anthony Myint is Award-Winning chef, restaurateur, author working to create a renewable food system. Co-Founder of Mission Chinese Food, Commonwealth and Zero Foodprint. ZeroFoodprint has helped hundreds of restaurants around the world understand the impacts of the food we serve and its effects on our climate. They strive to fund projects that encourage regenerative agriculture, producing more delicious ingredients and sequesters carbon in the soil. To date, carbon neutral restaurants have decreased emissions by an amount equivalent to not burning 1.3 million gallons of gas. MUTEK.SF has committed to help ZeroFoodprint recover as much as 500 tons of CO2 by donating a portion of the profits from the festival and all the culinary program events toward their mission. Industry folks: join their Earth Day campaign here. Top image credit to Tamara Palmer. Chef photo credit to Alanna Hale.